We’ve already talked about the different fabric printing techniques, remember? In this article, we’ll be revisiting these as we explain how to personalise a T-shirt. But digital printing is only one of the many ways out there for making personalised T-shirts that we want to share with you. We’ll also recommend some programs for designing the visuals for your personalised T-shirts. We’ll start here because we like to mix things up: we don’t just print on paper, but on fabric too. A few minutes ago, Carlo got in touch with us on behalf of a company that wants to print its logo on T-shirts, bags and other promotional items for a trade fair. The first question we need to answer is: “Which printing technique do you recommend for creating personalised T-shirts?”. Direct sublimation printing: perfect for synthetic materials like polyester. In this case we use washable, odour-free and hard-wearing inks that ensure bright, sharp colours. It’s no coincidence that this is the printing technique most widely used to personalise sportswear. Inkjet printing: best for natural fabrics, like silk and cotton. In this case, the ink is applied directly onto the fabric of the T-shirts being personalised. Screen printing: unlike inkjet printing, this is not suitable for reproducing images that are very detailed or have many shades of colour. We use it extensively to personalise fabric pouches and bags. Play around with Canva and Crello, two programs that let you create any type of artwork, even if graphic design is not your forte. We already talked about these tools in our article on stickers. So you know that you can also use these programs to create visuals for printing on T-shirts. Let’s recap quickly. Sign up for Canva and go to its control panel. You’ll see the different types of projects that you can work on. 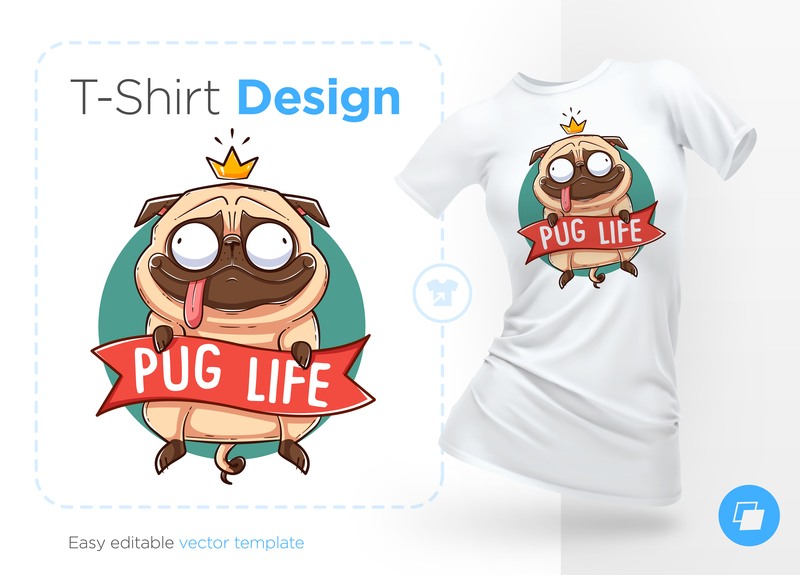 As you’ll notice, there’s no specific “illustrations for T-shirts” category, so you’ll have to go with the category that’s closest to the design you want to create. For example: got to draw a logo? Pick the logo category. Want to work with personalised photographs? Opt for photo collage. Basically, think laterally. Inside the chosen category, on the left you’ll have a selection of tools you can use to create your project. Once you’ve picked the layout, you can personalise it by adding images, photos and text, further customising these by altering filters, colours, thicknesses, fonts and backgrounds. You can of course use illustrations/photographs from the Canva gallery, or you can upload your own images. Very similar to Canva is Crello, a graphic design tool that’s extremely simple to use and offers lots of personalisation options. Log in, click on a category (just like you did for Canva): you’ll find a whole host of layouts and fonts to choose from, a library of 65 million images to help you find the picture you’re looking for and a selection of tools on the toolbar to customise it to your heart’s content. Once you’ve downloaded your design, if you don’t know how to create a personalised T-shirt, follow the step-by-step guide on our site. The first thing that comes to mind when it comes to personalised T-shirts are fabric prints, but there are also other ways of customising T-shirts. Specifically, patches and embroidery. There are two types of patches: sew-on patches and thermo-adhesive ones. Which type is right for you? A thermo-adhesive patch is attached to the fabric via a thermo-adhesive film on the back of it. The advantage? No need for needle and thread. If you have lots of T-shirts to personalise, we recommend this type of patch because it will save you a great deal of time. But if you want a more durable hold, go for sew-on patches: they’re a bit more complicated to attach but, once on, they last longer and are more resistant to washing. About needle and thread: it seems that the ancient art of embroidery is back in fashion. And we recommend it for personalising your T-shirts. Obviously, we’re not talking about business outfits, unless you’re looking for a deliberately hand-crafted effect. Have a look online and you’ll find various e-commerce sites that will create embroidery based on your design. So, the choice is yours: printing, patches or embroidery?